What is missing so far in the European Union are disaster management procedures, tools and systems which fully take into account the specific characteristics and requirements of large-scale international cooperation in emergency situations. These characteristics are distinguished by many diverse emergency response organisations that need to collaborate across technological systems, organizational borders as well as language and cultural barriers. They do not have the same background knowledge and arrive at different points in time. Technologies and procedures currently used in multinational disaster response and prior EU funded projects have provided many solutions for single aspects, but to the best of the Consortium’s knowledge there is no concept available yet which supports the entire process. This situation is the motivation for IDIRA. The mentioned characteristics of multinational disaster response led to the conclusion that we shall develop a system of technologies and guidelines which help in optimal resource planning and operations across national and organizational borders. The set of tools, interfaces and procedures developed in IDIRA will be designed to be configured, deployed and operated in a flexible manner, providing interoperable services for data integration, information exchange, resource planning and decision support to local and international disaster response units and decision makers. This core result of IDIRA will take the form an architectural framework and an exemplary implementation of a Mobile Integrated Command and Control Structure supporting co-ordinated large-scale disaster management. It is foreseen to make the best possible use of existing ideas, technology and standards, integrating available solutions and complementing them with new components where necessary. In actual operation, the components based on IDIRA solutions will be building on and be integrated with local command & control infrastructure and response procedures. In IDIRA we follow the vision of providing a conceptual framework that allows supporting and augmenting regionally available emergency management capacities (including the existing IT systems) with a flexibly deployable Mobile Integrated Command and control Structure (MICS), which aims at supporting co-ordinated large-scale disaster management. The essential element of the MICS concept is the IDIRA core system which is a coherent set of data models, interfaces for information exchange, software tools and services for coordinated resource management and decision support on response measures. 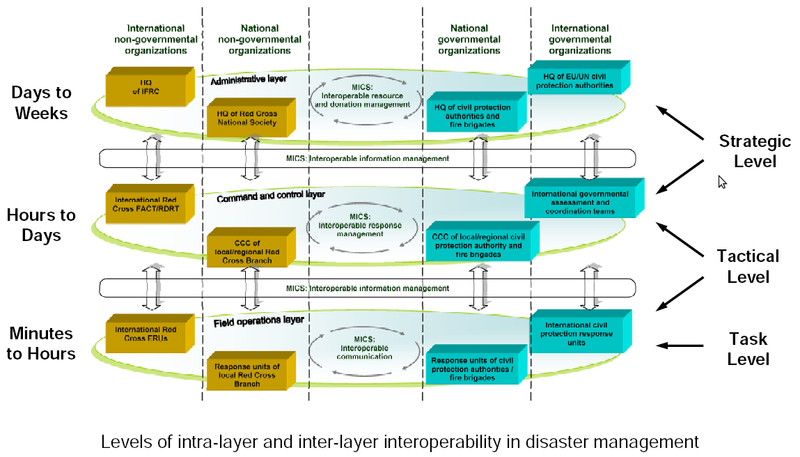 The project IDIRA wants to give an opportunity to disaster management organisations and interested researchers to express their experience, demand and ideas on technical and organisational interoperability for multinational disaster management actions. Organisations with relevant responsibilities or research interests can be informed on useful project results, field exercises, workshops and the like. The best way to get informed and involved is to join the IDIRA Advisory and End User Board (without obligations).